It was several months ago that I received a package from Atsko Inc. after a phone conversation with the owner Dan Gutting. I am long overdue for this review, (my apologies Dan) in fact there will be a couple more reviews covering other products that Atsko produces. I was first very impressed to learn that Atsko are also the makers of Sno-Seal boot dressing. I have been using Sno-Seal since about the 9 th. grade on my leather hunting boots. It too is a great product. Let me get back to the review at hand, that being the Sport-Wash. I have been washing all my clothes in Sport-Wash since June and have noticed several things. Among the obvious are that my clothes feel softer, are less stiff, hardly any lint in the lint trap of the dryer and my skin is no longer itching like it used to. The laundry detergent I was previously using, was from Costco and claims to have no perfumes, dyes or phosphates and is safe for septic systems. That being said, I find it interesting that there was such a noticeable difference between the two products. I used to have lots of lint to remove after each dryer load. My primary interest in Atsko Sport - Wash is the information pertaining to color enhancers that are used in laundry detergents. Specifically concerning hunting clothes and UV brighteners and how big game animals see and smell. "In low light and darkness, animals see in black and white and are tens of thousands of times more sensitive to ultraviolet and blue wavelenghts than are humans. After all, animals can run through the woods at night without bumping into trees. 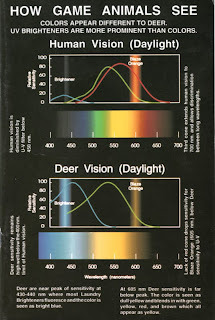 In daylight, deer see ultraviolet and blue light as blue, but thousands of times brighter than we see it because the sensitivity of their blue cones is not reduced by the presence of a UV filter. Instead of the way we see colors, deer see green, yellow, orange, red and brown all as shades of yellow because deer have no red cones." Excerpt from How Game Animals See & Smell, by Kurt von Besser Atsko/Sno-Seal Inc. I am not a scientist by any means, yet the information about Atsko's Sport-Wash have been scientifically studied by independent labs. No where else have I ever found such scientific documentation accompanying their product, as I have with Atsko. Haven't seen documentation with any of the Scent Shield, Scent Blocker, Dead Down Wind or Hunter's Specialties products. I have been very impressed with the results so far using Sport-Wash. I have done a fair bit of scouting for deer this Fall and have actually gotten very close. Sometimes I was never seen and a few times I think my movement gave me away. Yet now with Sport-Wash I know I have better concealment without the UV brighteners/enhancers etc. being in my clothing. I know what you're probably thinking, to good to be true or am I off my rocker? Well I invite you to test your clothing for yourself just as I have. All you need is a UV flashlight and you can order one at Atsko. The proof is in the clothing! No smell, no UV brighteners and it doesn't cost any more than conventional laundry soap. Using only 1/2 oz. per load of wash. I have switched to Sport- Wash for all of my laundry needs and no longer use dryer sheets. Atsko's website is packed full of information and I have found their customer service to be first rate and helpful in answering questions. I encourage any skeptics to give it a try, there is nothing to lose except being seen or smelled when you'd rather not be. Go ahead give Atsko a call and ask for a sample and order a UV flashlight while you're at it. You'll be glad you did. Make sure to click on the Whitetail Sight DVD at Atsko Inc. it is very interesting and worth the time. I decided to make this post about the Quail Flats Gunning Boxes that I make. Perhaps you have seen the photo on the sidebar. The picture at right is what got this whole thing going. It is still the one I use every hunting season, since about 1979 or so. 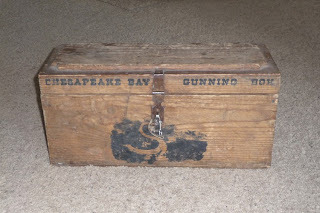 It all begin when my brother gave me this replica, of a "Chesapeake Bay Gunning Box" as a gift back in the late 70's. This box was not an original, yet it had been distressed and weathered to look as if it were an antique. The cool thing about my brother is that we usually get each other gifts, that we would like for ourselves.He realized after I started using it just how convenient it was to have all my shotgunning accessories in one location. So not long after he gave it to me, did he ask if I thought I could make one. The writing was clearly on the wall and my friends were also becoming more interested in acquiring one for themselves. Hence, the humble beginnings of building somewhat rustic and crude versions of the original. I tried different types of hardwoods and softwoods in search of an ideal balance between strenght, durability and being aesthetically pleasing to the eye. The one I received is made of Fir or Pine I believe, and has cut outs in the ends of the box to use for handles. The lid opens to 180 degrees and is held on by strapping hinges. A basic hasp is the closure for the lid and there was not a clip or snap supplied, so I attached one myself to hold the lid closed. It struck me that there was room for improvement regarding the handles, hinges and hasp closure. I felt that the size of the box and its interior tray, were ideal given its usage. Which leads me to a bit of history about this item. There is not much information about "Gunning Boxes" purse' other than they were used for holding ammo and related items for shotgunning. The earliest records I was able to find were dated back to the 1870's. 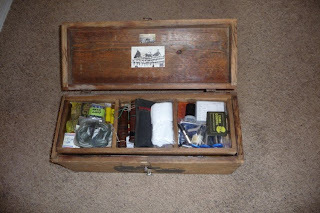 These days there are companies producing ammo boxes, yet those are different from a true Gunning Box. Also when you mention Gunning Box people often think it is used for storing your gun. Not so. Present day Gunning Boxes hold much more than just ammo. Mine has choke tubes, face camo, sharpening stone,steel, knife, duck and goose calls, cleaning kit, batteries, deck of cards, matches and that is just in the tray. Below the tray are 10 boxes of 20 ga. shells, gore tex gloves, fingerless gloves, hat, 7 x 32 leica binoculars, mag light, headlamp, gunning log, oil, tp, duct tape and dog biscuits. What is really great about these boxes is that everything stays in them year round. No more having to search your house, garage, closets etc. for this gear every Fall. With a Gunning Box you're always ready to go, just grab your vest, dog, decoys and hunting buddy. After making more than a half dozen or so(with hand cut dovetails) and giving them as gifts to my hunting buddies, in 2001 I decided to refine my initial efforts and do some serious marketing. The end result is the photo below. There are over 100 steps in making a Quail Flats Gunning Box. From the initial selection of solid Cherry hardwood to the milling, routing, sanding, dovetailing, rabbeting, grooving, hand planing, more sanding, lacquering, and even addressing the solid brass hardware. The hardware is all solid cast brass, meaning it is not stamped, pressed, cut or cheaply made in any way what so ever. Quite the contrary. The handles are made in England and have built in stops at 90 degrees to the box, so your knuckles don't get banged up by the box. The Brusso hinges are made in the U.S., machined from solid brass flat stock and have a stainless pin in the knuckle. They have a built in stop at approximately 95 degrees to support the lid/top in an upright position when open. Less chance of the top breaking by laying fully open at 180 degrees. Plus it makes a nice presentation and requires less space to open the top and access its contents. The hasp is a "Hook and Bail" type, which will not open on its own and is a very secure closure, U.S. made as well. The top and bottom raised panels are from a single piece of Cherry and are not edge glued to make up their width. Finding wide Cherry is not a simple task, yet it is worth the effort. These raised panels are recessed in a groove that is a bit oversized than the panels themselves. This is to allow for wood movement (expansion & contraction) throughout the year. Just that happy medium from the old school of hand built furniture. The tray bottom is a single piece of Cherry too, and allowances made here for movement as well. The tray dividers are pinned with Cherry dowels and the darker end grain makes for a nice contrast on the front and back of the tray respectively. 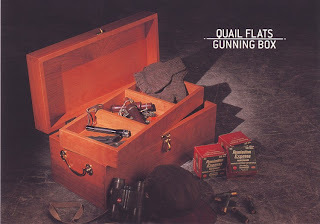 In all I made approximately 75 Quail Flats Gunning Boxes. I made them in runs of 10 at a time. Each box requires approximately 5 to 7 hours from start to finish. Their dimensions are 22" L. x 9" W. x 9 and 5/8" H. The tray is 2 and 5/8" H. and nests mostly in the top, allowing for maximum storage below the tray. I marketed them online and also in Gray's Sporting Journal and Sporting Classics magazines. 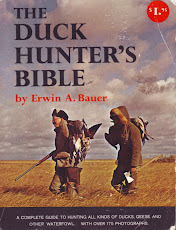 Most of my sales came from back East where there is more waterfowl history and recognition. Followed by the mid west for the same reasons. Lots of famous decoy carvers from both those areas, and museums dedicated to the preservation of waterfowl history. 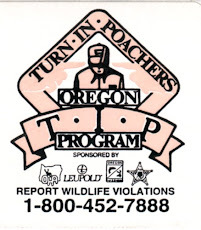 Over the years I have donated several Gunning Boxes to the Oregon Hunters Association, Ducks Unlimited and Pheasants Forever. It is just another way for me to give something back to this wonderful sport of hunting and to continue preserving the habitat for future generations. I've had several customers request brass engraved initial/ name plates. Typically these are put on the inside of the lid /or on the tray front. Reason for this is so they don't get scratched or scuffed up from other gear being put on top of them. I have chosen Cherry for many reasons and here are a few; it was used for roofing shakes many years ago and is naturally resistant to bugs. It is a tight grained wood with a wide variety of colors and patterns. It is strong, but not to heavy and can take a bump or two without cracking or splitting. If the truth be known it is my favorite wood to work with. It is honest and to a degree, forgiving as well. Cherry also gets a patina over the course of time and becomes darker and richer in color. I have made these boxes in everything from Western Cedar to Honduras Mahogany, Walnut, Maple and Hickory.If you are interested in a Quail Flats Gunning Box, just drop me a note and I'll be glad to get one going for you. They will last for many generations and are built to honor a lifetime of memories. It seems that the older I get, the faster times slips by. I have been busy trying to get work completed before hunting season is in full swing, as well as doing some scouting and the rest of life's day to day chores. On a recent trip I was able to find this small group of bachelor bucks who weren't to concerned about my presence. This is near a rural Eastern Oregon town of which needs to remain anonymous until after the season is over, or I have harvested one of these fine fellows. They are what is termed a "bench leg" deer. 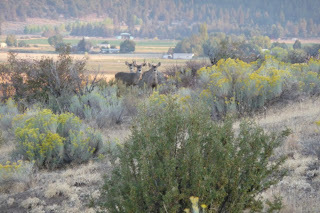 That being a mix of Mule Deer and Black tail because they cross over in to each others habitat zones, and inter breed. The ears are a bit shorter than your typical Mule Deer and the forehead considerably darker in some. Yet they have fairly heavy bodies and the wits of both, making them a challenge for sure. These boys have been hanging out for the past month in the same area, and I sure hope they continue to do so into the first weekend of October when the season opens. Just thinking about them everyday makes me a bit nervous and excited. Don't know if I'll find them again or if they'll give me the slip and be gone, gone, gone. It is called hunting for a reason and regardless of the outcome, I will have a good time just being out there. The chase is what really gets me excited, trying to out wit the wily critters on their own turf. So often I am an awkward visitor at best and as those who have gone before me say, "I would rather be lucky than good any day" I am in full agreement. There are still some things I need to get done before the season opens, like making sure my rifle and I are still on target and sighted in like we were when I put it away last winter. I shoot a Remington 7 mm Mag. and absolutely love it. It came with a Sims Limbsaver recoil pad and the recoil is very mild. I have a Leupold 3 x 9 by 40 VX 2 scope and so far it has treated me very well. I use shooting stix and sight in using them to make things as realistic as I can. I also check it on a bench and do a few off hand shots as well, just to be as comfortable as I can be. There is no substitute for shooting, the more you do it the better you'll be. Then again, when facing your moment of truth be it whatever season it is, nothing can get you prepared for the excitement of seeing that animal in your cross hairs. So stay calm, keep breathing and act like it is practice until after you've squeezed the trigger. Then get excited and twitchy. It was a early wake up call this past Saturday morning, in hopes of catching up with a couple Sage Grouse. I sprang from my slumber just a little before 4 a.m. and proceeded to get some coffee infused asap! Jet gave me one of those looks that said, "hey do you mind, some of us are still trying to sleep"? I gave her a belly rub and told her we're goin' hunting today! Let's go girl. And with that said, she too sprang to her feet. I threw some kibble in her bowl and some cereal in mine. Then we loaded the truck and headed for Fredrick's Butte and an old lake bed a few miles E. of there. We were on the road by 4:30 a.m. and arrived at our destination just a smidge past 6 a.m. There were a couple rigs already there and I think they were actually bow hunters deer hunting. As the sun began to brighten the eastern horizon I was getting my vest on and grabbing some water for us. It wasn't more than 200 yards from the truck when the first pair of Sage Grouse flushed at about 80 yards away. Geeze, much to far for a shot. Wow, I was a bit concerned that we may not get many shots if the birds are this wary. Jet was a long ways away from them too. We walked for about an hour before the next Grouse flushed and I fired a shot and knowing as I squeezed the trigger, it was gonna be a reach at best. Yep, nothing dropped. No feathers, bird or anything other than my wad. It is quite difficult trying to see where these birds land. They get up just high enough to clear the tops of the sagebrush and have very rapid wing beats followed by gliding with set wings. They blend in very well to their habitat and unless you can get your binoculars on'em chances are you won't see where they land. It will be in the general vicinity that you go to in hopes of flushing them again. We took a water break back at the truck for about 15 minutes, then got going for round 2. We never did flush anymore Sage Grouse yet we saw found several areas where they had been recently. They leave a very distinctive "cheeto" look alike dropping. Right down to the color and size. Jet got excited and worked her little heart out trying to find them, she just knew they're had to be one "not so smart" bird left behind. After 4 plus hours of walking and hunting ,Jjet and I were fairly tired. We headed for the truck and called it a day. The sun was getting high in the sky and Jet was wore out. We drank some water then headed for home. We had a good time and I didn't want to get either of us anymore sore or tired than we already were. Jet slept for the drive home and continued to do so for the following day, before she actually got her spring back in her step. Took me a few days to get over my soreness as well. The season is short and I doubt I will have the time to give it another try. Yet I will definately put in for tags again next year, in hopes of closing the distance. Single black female seeks companion, ethnicity unimportant. I am fun loving by nature, play well with others and am low maintenance. 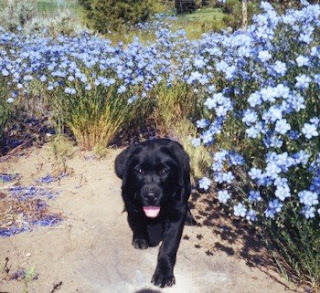 Some of my favorite pastimes are going for long walks, playing in the water, camping, riding in pickup trucks and sleeping next to a cozy fire. Candlelight dinners will have me eating out of your hand. I am loyal and will greet you at the door when you get home from work, wearing only what nature gave me. Please give me a call at (503) 768-4225 and ask for Jezzabell.